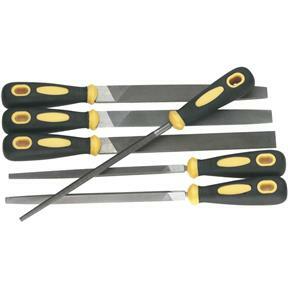 Sure-grip rubber handles make this 6-Pc. Rasp File Set a pleasure to use. Set includes Round Rasp File, Square Rasp File, Half-round Rasp File, Triangular Rasp File, Flat Rasp File and Tapered Flat Rasp File. Rasp Files measure 12-1/4" overall.